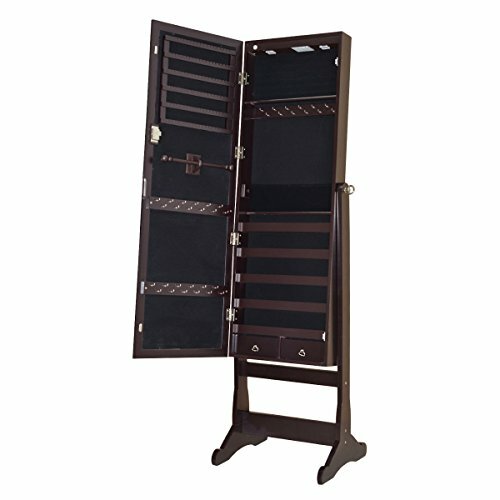 This Is Jewelry Cabinet Which Is Perfect For Organizing And Storing Your Favorite Rings, Necklaces, Bracelets. Made Of High-Quality MDF, This Jewelry Cabinet Is Sturdy And Durable. It Is Equipped With A Big Mirror And Owns A Powerful Storage Capacity. For Its Built-In Different Compartments And Separate Hooks, You Can Save Your Favorite Accessories Safely And In An Organized Manner. It Makes It Easy To Choose Your Jewelry In The Morning Without The Frustration Of Looking For Loose/Missing Pieces.